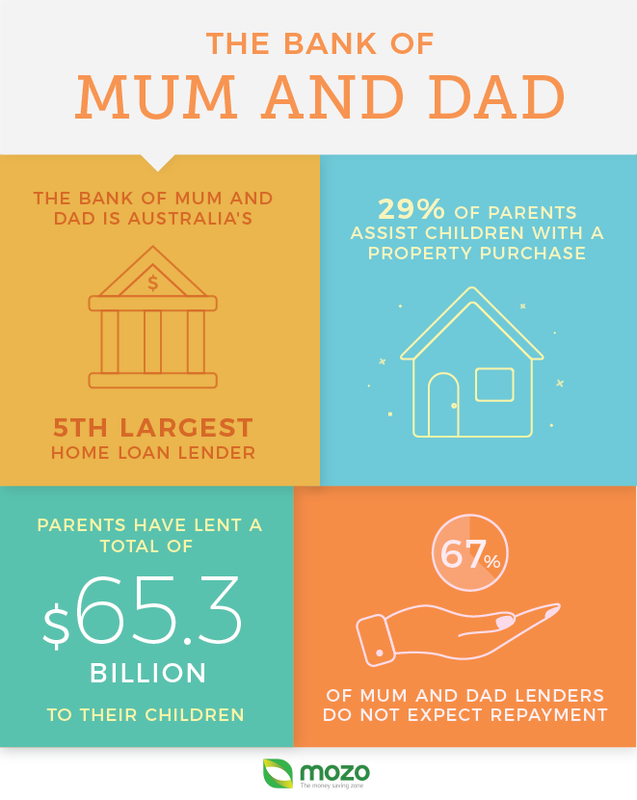 The "Bank of Mum and Dad" is now the nation’s fifth largest mortgage lender, according to new research from financial comparison website Mozo.com.au. Sitting behind the big four banks – ANZ, Commonwealth Bank, NAB and Westpac – the rate of parents' lending reveals that many first-home buyers are unable to independently take their first step on to the property ladder. Around 29 per cent of Australian families offer financial assistance to their children, equating to a national figure of around 1.02 million families. On average, first-home buyers have borrowed $64,206 – a national total of $65.3 billion. Mozo Director Kirsty Lamont said for many first home buyers, it can take years to scrimp and save for a home deposit, all the while house prices continue to skyrocket, becoming increasingly inaccessible. "We’re seeing the Bank of Mum and Dad playing a huge part in helping children take their first step towards acquiring a home,” she said. NSW is the most generous state for parental lending with an average lend of $88,250 per family, totalling $32.7 billion. VIC and SA rank second, lending around $63,000 per family, while ACT and NT are the least generous, lending $20,083 and $15,000 per family respectively. Mozo’s Bank of Mum and Dad survey found that the most popular ways for parents to help their kids get a foot on the property ladder are allowing their child to live at home rent free while saving for a deposit and contributing money towards a deposit. Other options included acting as a guarantor, assisting with repayments, or buying property on behalf of or as a partner of the child. Lamont said the sheer luck of family assistance can be a deal breaker as to whether or not the younger generations have the opportunity to purchase their own property. "While it may be cause for despair there are ways for first home buyers to save for a deposit without the help of Mum and Dad," she said. "From ditching credit card debt to looking at first home owner grants in your state, there are ways to make your first home purchase a possibility." In order to help their kids onto the property ladder, 66% of parental lenders have chipped into their own savings while 26% have cut back on expenses and 13% have pulled equity from their own home. The majority (67%) did not expect repayment for their contribution while 29% expected payment in part or full, without interest. The most expensive methods of helping children are buying property on behalf of the child (costing parental lenders an average $231,750) and buying the property as a partner ($155,762). Assisting with repayments is costs an average $31,711 while allowing kids to live at home rent-free costs an average $25,441.